Learned at age 17 from books at New York City branch library. Then a student of Eddie Fechter. Moved to Hollywood in 1967, studying under Dai Vernon and Larry Jennings. Top-line pro close-up. AMA Best Close-up Magician 1971 and 1974. Mentor of Bob King and Robert Lansing. Cruise ship worker and magic shop demonstrator. 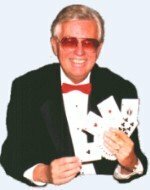 Resident magician at Golden Nugget (Lily Langtry Room, etc) in Las Vegas since1976. See Jeff Busby, Michael Skinner's Intimate Magic (1982, 45pp); Mike Maxwell, Michael Skinner's Ultimate 3 Card Monte (1990, 20pp); and Classic Sampler (1996, 113pp). Tricks in Talisman , Epilogue , Arcane , Magic , Magic Menu . The protagonist of William Murray's 5 detective novels (a night club magician and private investigator) is based on Skinner. The Torn and Restored Cigarette Paper is a classic sleight-of-hand close-up effect. Skinner's main contribution here is the performance which is humorous and fits his personality. The technique is Nate Leipzig's technique which can also be found in Stars of Magic or Dai Vernon's Tribute to Nate Leipzig . This is a wonderful classic cut and restored rope routine performed to a lovely script. The rope is cut and restored twice and in the end the rope vanishes only leaving a short piece behind in the spectator's hand. The ace through 10 of Diamonds are inserted into the pack, each card at a different location. The deck is shuffled and then Michael produces each card one by one in different ways using pop out moves, cuts, and other flourishes. This is an improvement of an effect popularized by Eddie Fechter. However Eddie produced each card the same way using the gymnastic ace production from the Paul LePaul book.